Last weekend I participated in the Warrior Dash – a 3.3 mile mud run with about 14 obstacles throughout, ranging form scaling walls to diving into a mud pool. 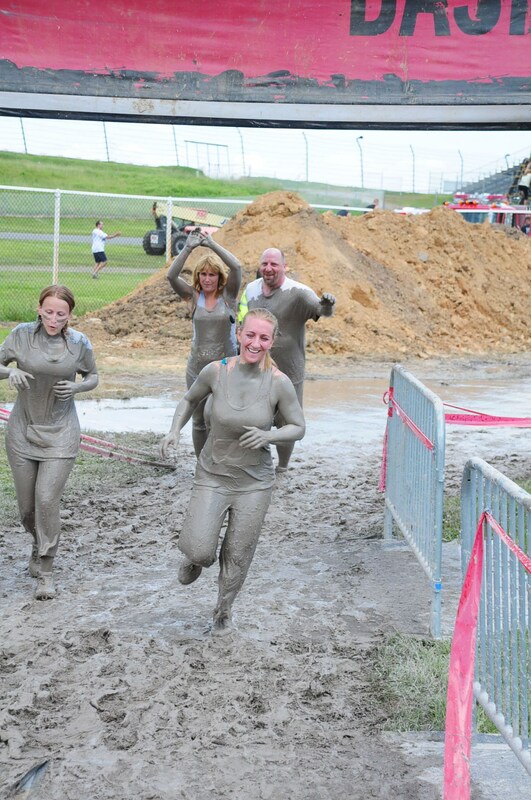 This was a dirty good time, and despite the fact that I really do not like running, I never stopped. I made my way through and finished in the top 20% overall and top 8% of women. So “Go me,” I do believe I deserve a cookie or two after that! I ran with one of my best childhood friends, Jason. I spend time with Jason and his family about twice a year or so, and it just so happens that last summer I was visiting them and it was my intent to bring the Raspberry Custard Bars that I have included below. Unfortunately, at that time they didn’t come out quite right and I ended up throwing them all away. I decided to try again this summer, and yet again something went wrong. I decided that it was one of the most confusing, poorly worded recipes I had ever seen (shame on you, Better Homes & Gardens!) and I rewrote it in plain English. When I followed my own interpretation of the recipe (which is, of course, what I include below) it was easy to make and a refreshing summertime snack. Preheat oven to 350. Line a 9×13” baking pan with aluminum foil, leaving extra to overhang the edges for easy removal. Using your mixer, beat butter at high speed until it begins to soften, about 30 seconds. Add brown sugar and salt, beating on low speed to incorporate. Add 2 cups flour, again beating on low speed to incorporate. Increase speed and mix until all ingredients form an even dough. This is a shortbread, so don’t be afraid of over mixing, it should be really well combined. Break dough into chunks and press into the pan to form an even layer. Bake for 20 minutes or until the dough is set. Cool for 5 minutes. Brush exposed sides of foil with softened butter to prevent filling from sticking. Spread raspberry preserves/jam over crust. Sprinkle with fresh raspberries. In a large bowl, beat cream cheese and goat cheese (if using) for about 30 seconds on high speed. Mix in sugar and 1 Tablespoon of flour until combined. Continue, adding egg, egg yolk, lemon zest, lemon juice, and vanilla, beating until smooth. Pour custard batter over berries, tilting pan back and forth to distribute evenly. Bake at 350 for 25-30 minutes or until set. Transfer to a wire rack and cool for 1 hour. Then, move to refrigerator to continue cooling for 2 more hours. Top may crack during cooling. Remove from pan using foil overhang, cut, and dust with powdered sugar. 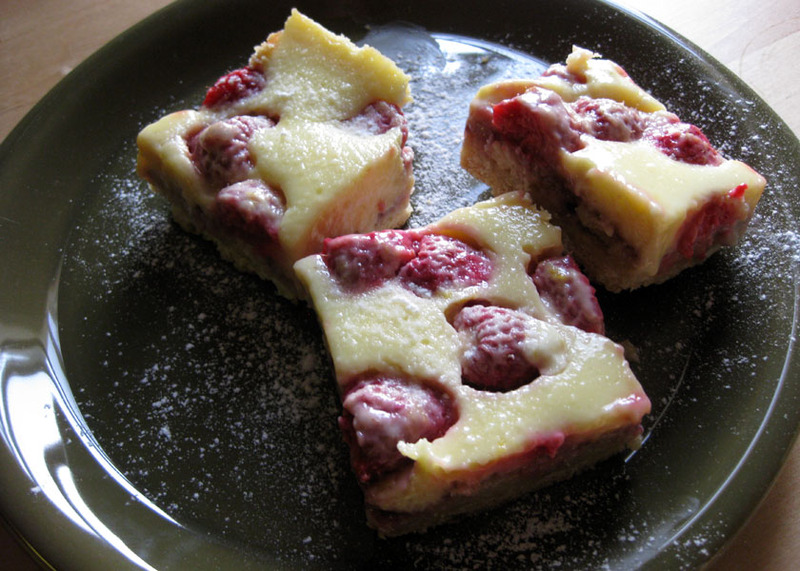 This entry was posted in Baking Jumbles and tagged bars, custard, fruit, raspberry, shortbread. Bookmark the permalink. YUM! I made these today, but with a slight variation. Since I have a plethora of blueberries from a recent blueberry-picking outing, I substituted blueberries and blueberry jam for the raspberries and raspberry jam. The result was wonderful! A nice flaky crust topped with creamy custard and sweet fruit. I will definitely make these again, and next time maybe I’ll have raspberries on hand!